The delay in getting Raleigh Police Department officers to the scene of an East Raleigh break-in last month was due to a dispatcher error, Raleigh police and communications officials told neighbors. Representatives from the Raleigh Police Department and the Raleigh-Wake Emergency Communications Center (ECC) met last Thursday with about a dozen neighbors to discuss the incident and recent crime trends. A call of a break-in, normally the highest priority, was mistakenly coded by a dispatcher as an attempted break-in rather than as in-progress. The call then entered the queue for Raleigh police to be dispatched. Officers arrived at the Plainview Avenue home fifty minutes after the first call arrived. “We did make a mistake,” ECC Training Manager Angie Shultz told neighbors, apologizing for the error. She and ECC QA Coordinator Chris Walton walked the attendees through the process followed that evening and in general how the ECC works. Hello downtown families! 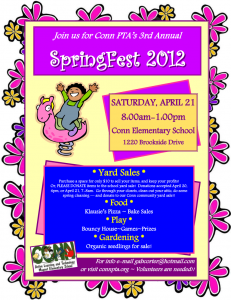 Please mark your calendars now, and plan to join us at Conn Elementary on April 21 for SpringFest. 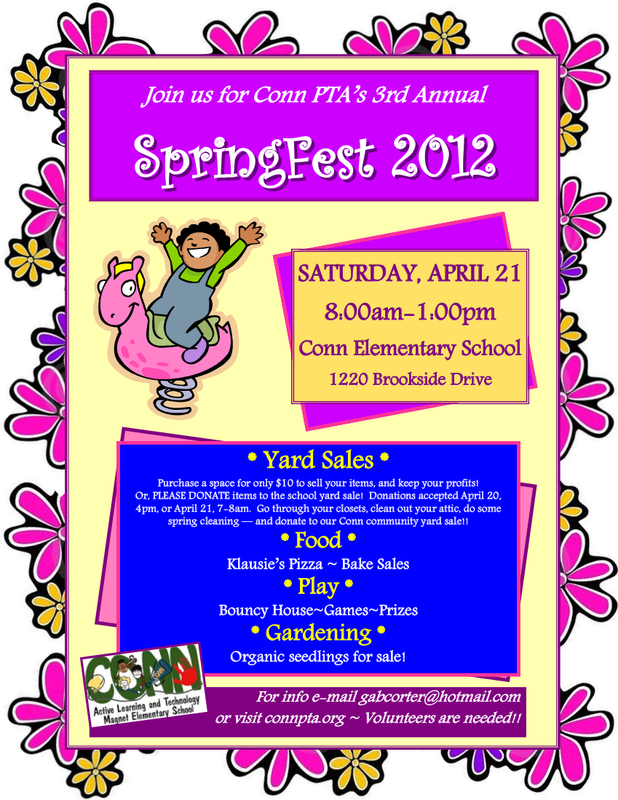 There will be a yard sale, pizza truck, bouncy house, carnival games, organic plant and herb sale (homegrown by Conn parents), a bake sale, and more! Money raised will go to the Conn PTA. Please see our attached flyer, and feel free to share it with friends. Everyone is welcome! Contact: Gabriella Corter, gabcorter at hotmail dot com if you want to reserve a space and sell your Yard Sale items on that day. The cost is ten dollars to benefit the PTA. You keep all the proceeds you make. The East CAC will hold its November 2011 meeting Monday at 7 PM at Lions Park Community Center, 516 Dennis Avenue. http://is.gd/nwDQ. The meeting will be streamed live on http://www.eastraleigh.org/stream.html. The year has flown by! The holiday season is upon us and its time for our last meeting of the year. After the usual updates, we’ll discuss the St. Augustine’s Stadium committee, followed by a holiday party with food and drinks. Below is the full agenda. Come out, get informed about your community, and then mingle with the many great neighbors of East Raleigh. Hope to see you there!